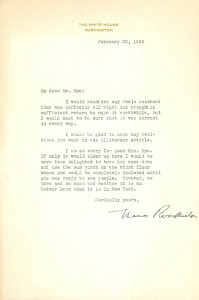 Typewritten Letter Signed, one page, octavo, February 20, 1936. On White House stationery, to her literary agent George Bye. “I would consider any radio contract that was perfectly all right and brought in sufficient return to make it worthwhile, but I would want to be sure that it was correct in every way. “I would be glad to make any revisions you want in the illiteracy article.